Miles seems to be the sole employee in the establishment. He does the housekeeping. He tends the bar. He doles out the keys. And he watches who management tells him to watch. The El Royale hasn’t seen much business since the place lost its gambling license the year prior, according to the all-talk vacuum cleaner salesman Laramie Seymour Sullivan (Jon Hamm) waiting for service at the counter. But on this particular night Miles services Laramie, a priest named Father Flynn (Jeff Bridges), an underpaid singer named Darlene Sweet (Cynthia Erivo), and a “hippie” named Emily Summerspring (Dakota Johnson). On almost all accounts, though, these characters are not who they claim to be. 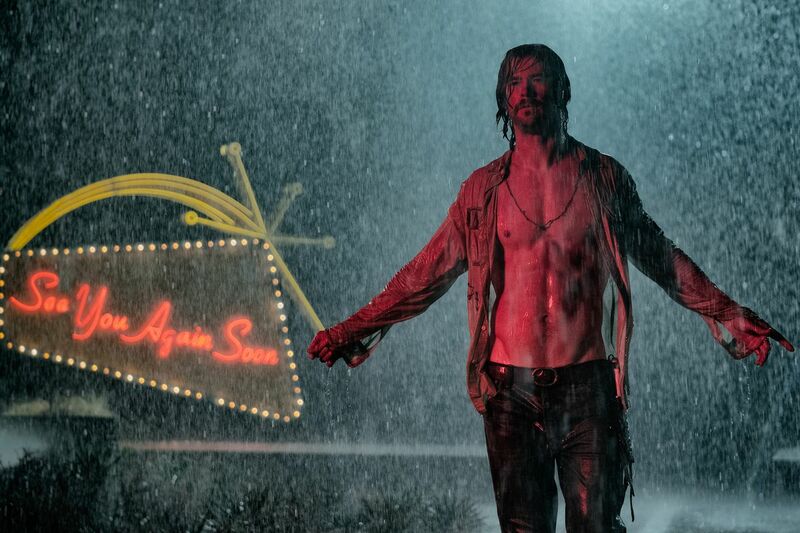 Deception and double identities pervade Bad Times at the El Royale, Drew Goddard’s directorial follow up to the cult horror hit The Cabin in the Woods. As in The Cabin in the Woods, the motel has an added layer of voyeurism. It is a literal frame placed in front of the characters. Characters being watched while we watch them. Unlike in The Cabin in the Woods, however, this reflexive perspective on the act of looking is not used toward some greater purpose. In Cabin, the voyeurism helps deconstruct genre. In El Royale, it adds another mystery to the pile. And it is a large pile. Each character’s added baggage of lies and deceit stack and interweave with one another until the El Royale becomes one giant puzzle box. The mysteries may be intriguing—they certainly were the biggest draw in the film’s trailer, next to Chris Hemsworth’s washboard stomach—but they amount to very little once the puzzle is solved. This is the downfall of El Royale. The script is intriguing and instantly engaging. It pulls us into the insular world of these characters on this one night in this kitschy motel. It jars us with overlapping action across multiple scenes, which depict the same events from slightly altered perspectives. But this intrigue ultimately leads to nothing. Even by the time you hit the overlapping action, the seams of this null possibility start to show. The shock of the initial moment is enough to urge you to keep watching. The second iteration of the same event adds new elements to what is happening. But by the third go around, we are watching the same scene without new information being presented. It is merely shown from a different character’s vantage point (a la Vantage Point. Remember that clunker?). Like the wonderfully fakey set design of the motel, the artifice of the script begins to rear its ugly head. If you haven’t learned it by this point, it becomes evident that the characters are nothing more than their dual identities. A person in this film is either what they claim to be or something else, but either way it is just one thing. In The Cabin in the Woods, the characters are similarly archetypal. But, again, toward some larger thematic purpose. Here, that purpose is not clear. El Royale does not deconstruct noir like Cabin deconstructs horror. It merely uses noir for aesthetic purposes in order to tell a windy story. The continued comparisons to The Cabin in the Woods is warranted only because the two films share so many similarities. What Goddard nails in the former he utilizes for much flatter means in El Royale. His direction and writing favor heavy plotting over all else, leaving character and acting as tertiary concerns. As such, the characters are dull cogs in the storytelling machine, leaving the actors to tread water on their own devices. Hamm and Hemsworth stand out in this formula, their alien accents taking over their performances as a means of compensating for lack of character personality. Bridges, too, comes off flat, with the tics he adds to his performance coming off similarly alien. Erivo and Johnson, conversely, fare much better with their performances, namely due to the fact that they are not trying to hide the single dimension of their characters underneath affectations. The single-location world of Bad Times at the El Royale is certainly immersive. The sets are decorated and shot with creative flair. The period appropriate music and color palettes, accompanied by noir elements, make up a chilly atmosphere. And the script builds itself up to a place of high mystery that makes it hard to look away. And yet, the conclusion does not live up to the build. Goddard does not have the benefit of a literal fun house of artifice affixed within the diegesis that could justify the contrivances of plotting needed to litter the film with mystery boxes. This was the crucial piece that made The Cabin in the Woods so effective. The script for El Royale does not bother with justifications. It bothers with explanations and backstories, retellings and confessions. It does so with the hope that it can wriggle itself free from the mystery without providing well-drawn characters, and then, in the end, it asks us to feel something for the most morally positive characters. Thematically, Goddard concerns himself with religion, particularly the black-and-white morality therein. He tries to challenge this by painting in the gray area and allowing his characters to absolve themselves of their past transgressions through righteous acts in the present. But this is a hurried resolution that takes place in conjunction with a hurried climax, making it all feel rushed and haphazard. Frankly, it is a mess of a climax that upends the mystique of the first two acts. With Bad Times at the El Royale, Goddard takes an ambitious concept and spreads it thin over a 140-minute runtime. The initial buzz-worthiness of the tense intrigue and the mysteries that each character adds to the plot fades out over the course of the film. Any embers of this compelling narrative that are left over are tamped out entirely by the climax, which leads into an epilogue that believes we bought into these empty characters from moment one. The result of all this is a film whose gears start grinding early and continues grinding, louder and more noticeably, until the final unaffecting image.